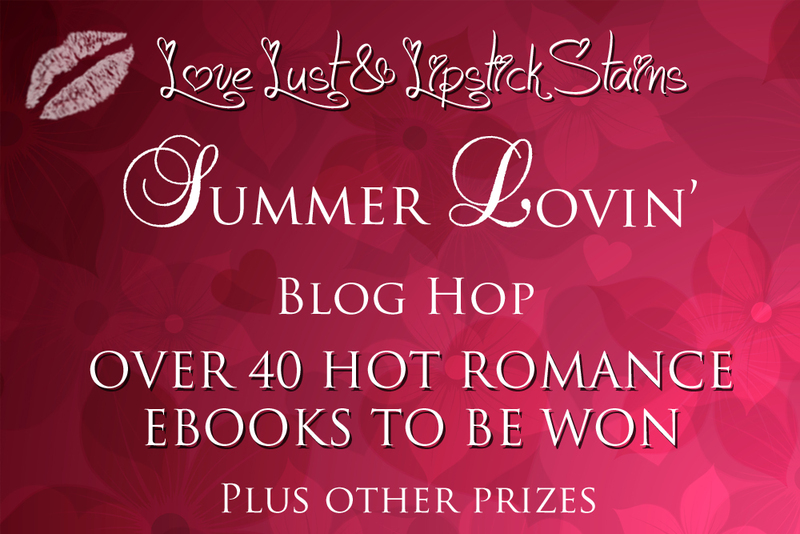 Welcome to the Summer Lovin’ Blog Hop! Over fifty authors and bloggers have joined together to give you the chance to win an awesome bundle of books as well as read some great posts. Be sure to visit each blog in the hop and comment with your email to increase your chances of winning. Each comment counts as an entry! Our lovely bloggers are also offering individual prizes so be sure to check them out. So what is it about summer you love best? The extra-long nights, fun-filled vacations, poolside lounging, or something else entirely? Maybe it’s indulging in summery foods like sweet corn, watermelon, soft ice cream or fresh strawberry pie. It could be ditching your shoes in favor of sandals or flip-flops, relaxing with a good beach read or finding the perfect picnic spot. Summer brings fireflies, fragrant white jasmine, sun-ripened berries, and the magical embrace of a poet’s twilight. I love all of those things, but this summer I can add something new to the list. If you enjoy romance and mystery with an older woman and younger man, I hope you’ll give TWELFTH SUN a try. To celebrate all things summer and my new release, I’ll be awarding a $5.00 gift card to Amazon to one lucky commenter. Just tell me what you love best about summer and be sure to include your email address with your answer. The winner will be announced Friday on my blog. The fun isn’t over! Be sure to check out all of the other authors and bloggers participating in the hop by clicking the cute linky critter below! This entry was posted in Blog Hop, Book Release, Romantic Mystery, Twelfth Sun and tagged Blog Hop, Book Release, Mae Clair, Romantic Mystery, Summer Lovin' Blog Hop, Twelfth Sun by Mae Clair. Bookmark the permalink. I can’t wait for summer to come back around. We’re in the middle of winter Down Under. In New Zealand, summer arrives on December 1st. Once that time arrives, I’ll be hitting the beach. Thanks for the hop, Mae. Huge congrats on the release of Twelfth Sun. Thanks for dropping in on my hop and the congrats on TWELFTH SUN. It’s kind of cool to have a summer release this time around! I love summer for all the reasons you listed, and for the sense of freedom — even if I’m not free to spend the whole day outside reading, like when I was a kid. LOL Congrats again on the release of TWELFTH SUN — I’m so excited to read it! I love my summers. With my 2.5 months off from school I get to act silly, play in the yard, and just run with the kids. Not to mention, do all the projects around the house that don’t get done during the 9 months of school. I also get to do lots of catch up reading. Hi, Mel! Thanks for the congrats. You are so lucky having those summer months off. It sounds like you have a lot of fun….and a lot of projects to catch up on, LOL. Thanks for the congrats and dropping by to share my day! I love when the mountains come out in Seattle. They hide all winter long, and when the sun comes out, so do the Cascades, Olympics, and, of course, Mt. Rainier. Congrats on the release, Mae! Can’t wait to read it! That view sounds so stately and majestic. What a fantastic sight that must be. And I think I saw your part of the world was having higher temps than normal. It must be beautiful in Seattle right now. bathing suits! summer means lots and lots of bathing suits and this crazy lady is addicted to collecting them. I don’t even swim, just wade in the shallows and decorate the sides of the pool, but for some reason i’m a sucker for a good deal on a swimsuit! LOL! Hi, Tera. Love your description about decorating the sides of the pool. That’s about my speed in the water too. Thanks for visiting and commenting! Mae! Glad to see you on the LL&LS blog hop! I’m at the 50% mark in TWELFTH SUN and am chomping at the bit for your love birds to get it together – and I’m no closer to solving the mystery, but look forward to the big reveal! Heya, D.B.! Oooh, I like the sound of that and I’m glad the mystery still has you guessing 🙂 Thanks for the wonderful plug! Congrats on the official release, Mae. Both are wonderful things about summer. Thanks for visiting and commenting! I love the warm weathe3r and sleeping in . As well as going to the beach. Which I hope to get to next year. Love the beach! I’ll be headed there later this year and can’t wait! Enjoy those late mornings while you can still savor them. Summer breaks are much too short! Summer memories– all of them, warm and sunny, bright and loud like fireworks, and laughter all reside somewhere, all wrapped up together in head and heart. Those long days are some of the best of my life. I’m very sentimental right now, and your blog post just really made me realize how much summer means to me, Mae. Thanks! Now, I’ve got another great memory to add to the mix– your second book, TWELFTH SUN, being released! I’m so happy for you, friend. And I LOVE this book. What a lovely cover for a summer release. I hope tons of folks are drawn to it, buy it, and love it, like I did. Your writing is amazing, and what a great romantic mystery to take to the beach! Thanks for taking part in the hop, Mae, and congrats on your release! Summers in the UK can be pretty miserable but I love it when the sun is shining and the kids aren’t stuck indoors. The sound of kids laughing outside is the best! Reading is always good. 🙂 Stay safe in the storm! No much, can’t wait til it’s over. I love all the free time I can dedicate to reading! Beach reads are great! Or lounging by the pool, or just summer lounging. I’m glad you’re finding so many great reads. Thanks for visiting my blog! I love summer because I’m able to wear as little as possible and also walk barefoot. I love going barefoot. Hey, I’m barefoot right now, LOL! I could live fulltime at the beach (preferably in a warm climate, LOL). You are so right about the ambiance of a shore setting. I live in Florida…..so my fave thing is definitely reading on the beach! The best thing I love about the summer is going to the beach. Thanks for the great giveaway! So many beach lovers. I won’t argue with that! I think my favorite thing about summer is all the fresh vegetables!!! Even though they tend to mess with my blood thinners (too many vegetable such as dark green, leafy ones thicken blood) I can’t resist them. My doctor always knows that my medication will have to be adjusted in the summer because of this (I have a history of blood clots so have to take blood thinners every day to prevent more). I’m so sorry to hear about the problems you’ve had with blood clots, June, but I do agree with you about the fresh vegetables. What a great answer! Veggies are my favorite food group, which I know is kind of odd, but I’ve loved them since I was a kid. My parents never had a problem getting me to eat them. It was meat that was the obstacle, LOL. I love being able to sit outside and read. Yay to both of those! So pleased with your new release.